Physics can be baffling for those of us who didn't take it past GCSE, but there's no argument that the science that aims to explain the world around us is fascinating. This week the 2016 Nobel Prize in physics was awarded to three British scientists : Professor David Thouless from the University of Washington, Professor Duncan Haldane from Princeton, and Professor Michael Kosterlitz from Brown. The trio used advanced maths techniques to study unusual phases or states of matter. When materials are exposed to extreme temperatures, they can take what they call "exotic states" such as superconductors, superfluids, or thin magnetic films. And these can be used in many things. Superconducting materials, for example, can help create super-fast electronic circuits . Superfluids, on the other hand, are used in spectroscopy — the study of how light breaks into its constituent colours. And thin magnetic films can help improve computer data storage. All of this falls into the realm of a field called topology. Topology is a branch of maths that describes the properties of shapes that only change in terms of how they're arranged in space — not in their shape or size. Take a toilet roll and a doughnut — they'd have the same topology (they both have one hole) even though they might be different shapes and sizes. Topology also allows for continuous changes, such as the bending or stretching of an object, as long as that change can be undone. If you had a piece of dough in the shape of a circle, for example, you could turn it into a square or a triangle by pulling on different parts. This wouldn't change the dough's topological state. If you were to turn that same dough into a figure-eight, though, that change would not be accounted for, since you'd have to break the connection in the middle to "undo" it. Many 'usual' materials can be understood in these simple topology terms, and now so can 'exotic' ones. It has long been known that "usual" materials, that take solid, gas and liquid states, can be understood in these simple topology terms. The team found that at very low temperatures, certain "unusual" or "exotic" states of matter can also become visible and also be described in this way. A these very low temperatures, matter behaves in unexpected ways. Quantum effects become visible, such as superfluidity; when a liquid flows without friction near absolute zero temperatures, or superconductivity; where electron gas — an electric current — flows without resistance in a conducting metal. In other words, the resistance usually encountered by all moving particles suddenly disappears when it's cold enough. Phase transitions happen all the time, such as when water freezes into ice or evaporates into a gas. However, a topological phase transition is not like that. The transition in a superfluid can be explained with a pair of vortices, which are holes within a thin layer of the superfluid that are tightly paired. Excited particles, air, or a vacuum can exist within each vortex. When the temperature rises, these vortices suddenly move away from each other, which is when the topological phase transition can be pinpointed. In the cold, vortex pairs form and then suddenly separate at the temperature of the phase transition. In the 1970s, Kosterlitz and Thouless overturned a theory that superconductivity and superfluidity could not occur in thin layers. They demonstrated that superconductivity occurs at low temperatures and also disappears at higher temperatures. 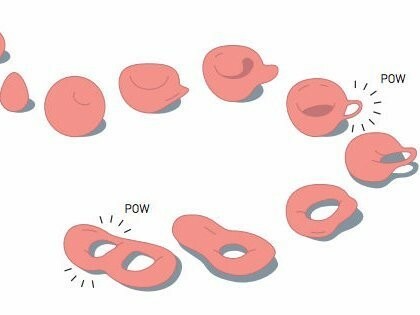 In topology terms, it's like a pretzel turning into a bagel. 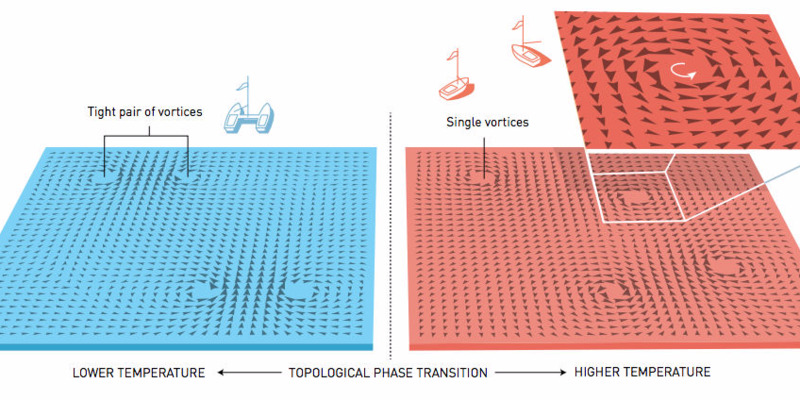 In the 80s, Thouless explained a previous experiment with very thin electrically conducting layers, the different steps of which were topological in nature. Around that time, Haldane discovered how topology could be used to understand the properties of chains of small magnets in some materials. This theory has been a useful tool in many areas of physics, such as atomic physics and statistical mechanics. The decades of research mean that it is now possible for scientists to look at new phases of matter. Over the last ten years research in topology is revealing more and more secrets about how different matter behaves, and it could aid research in the areas of material science, electronics, and quantum computing.